It’s 9.30am and I’m already munching my way through my second lumpiang sariwa, a classic Filipino spring roll that has been freshly wrapped and packed to bursting with carrots, cabbage, shrimp, tofu, peanuts, rice noodles, seaweed and pork.There are two sauces set out on the table in the tucked-away courtyard of the New Po Heng Lumpia House restaurant: the first is syrupy and honey-like; the second is chilli. Ivan Man Dy, the leader of our five-strong group, demonstrates what to do by putting a drop of each on top of his lumpia and spreading it with a spoon. He adds ground peanuts, toasted rice noodles and minced garlic with vinegar (for an extra kick) and takes a bite. It’s a delicious and filling starter; I wonder how I’m going to find room for the next four courses. This is the first stop on the Binondo Food Wok in Manila’s Chinatown. We met Ivan, who strolled up while finishing a mouthful of an early-morning meat pie, outside the Binondo church half an hour earlier as colourful jeepneys were taxiing people to work, the back streets of the city still sleepy and quiet. 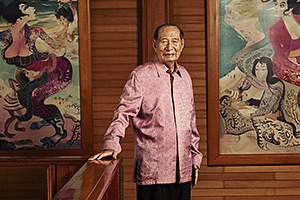 Ivan is the go-to guide for television crews filming food programmes in the area; his claims to fame include showing American chef Anthony Bourdain around Chinatown. He began by sharing a bit of history. I learned that the Chinese who came to live in Manila in the 16th century were one of the key ethnic groups to shape the city. They included the Hokkien people, who descend from Fujian province. It’s the Hokkien, I’m told, who I have to thank for the lumpia recipe. 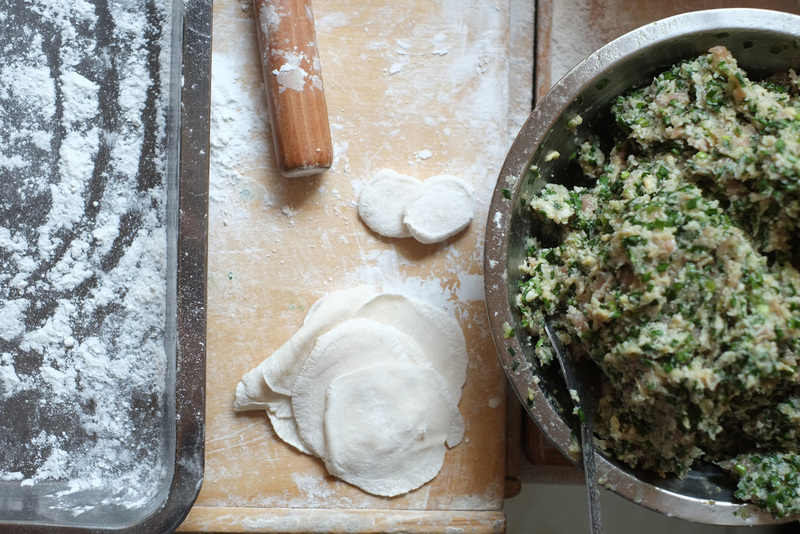 Above: At Dong Bei Dumplings, a mix of mung beans, mushroom and celery is piled on to circles of pastry and pinched into a shell shape. The Spanish lived in Intramuros (“within the walls”), while the Chinese set up their homes “extramuros”, north of the river. 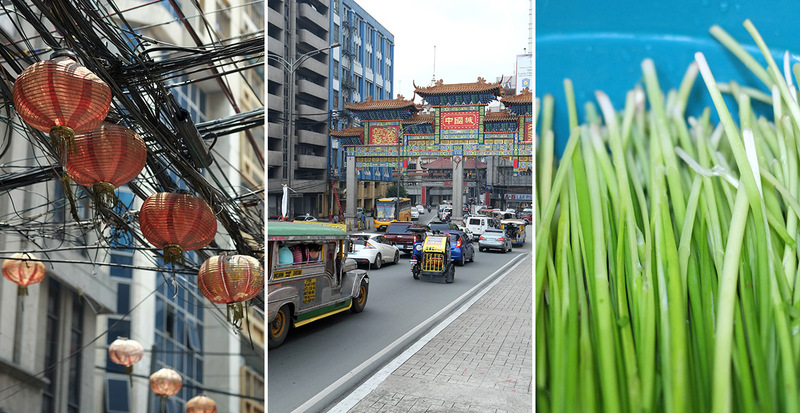 Founded in 1594, Binondo is the oldest Chinatown in the world and it remains one of the grittiest, most characterful parts of the city. 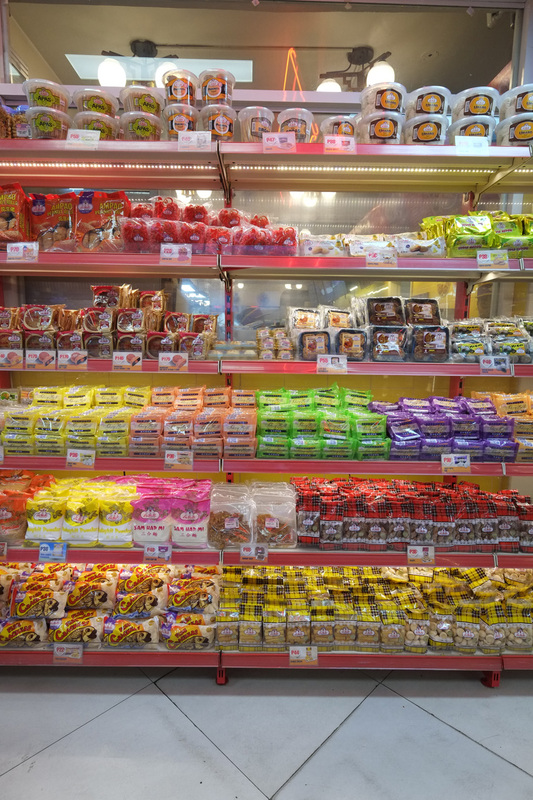 Many of the restaurants are unnamed and unassuming, the kind of places — like our second stop, Quik Snack — that are easy to walk past without pausing to give a second glance. 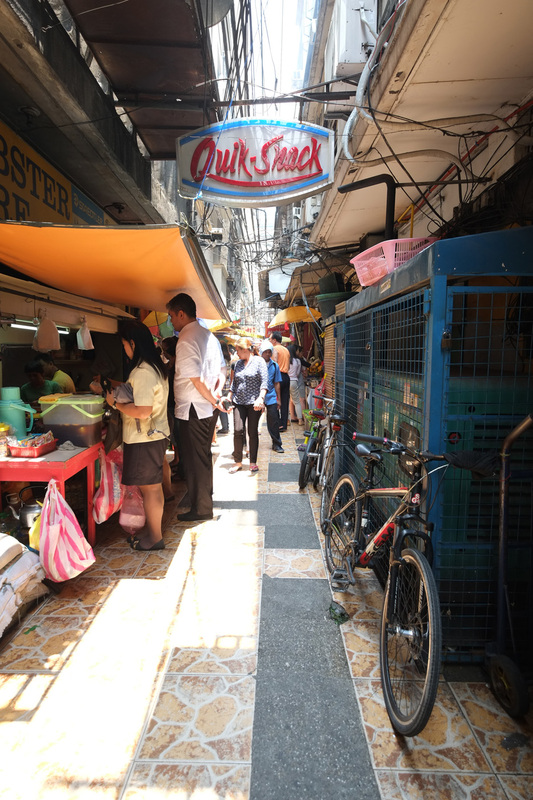 Quik Snack is hidden halfway down Carvajal Street, which is more an alley that smells of pomelo and sour tamarind soup. It is also renowned for being home to the Talipapa market, which is lined with stands selling fruit and vegetables, black chicken, sea cucumbers in buckets of water and purple salted eggs (Binondo has long been a centre for trade; the Divisoria market just down the road is the biggest in the city). 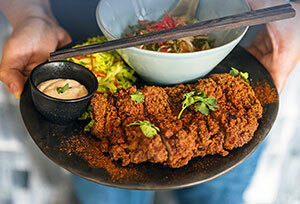 The restaurant, which was set up by the matriarch of the family, 60-year-old Amah Pilar, in 1967, serves up home-style cooking (Hokkien food spiced up with other Asian flavours). Originally, many of the dishes on the menu were vegetarian, influenced by Amah’s time serving in Manila’s Buddhist temples; today, the third generation who run the restaurant pay homage to her specialities, but have evolved the menu to make it relevant to modern ingredients and tastebuds. We try four dishes: a sweet-tasting kutsay, an empanada-like pie filled with chives, tofu, mushrooms, herbs and spices; egg noodles cooked in the restaurant’s renowned satay sauce with slices of beef and crunchy, green kangkong water spinach; a kikiam sausage roll with pickled radish; and a slab of tofu that has been deep-fried, served on a bed of sweetened soy sauce and slathered with chilli sauce, cucumber, peanuts and coriander. “It looks like Merry Christmas,” says Ivan, as we pick up our chopsticks and tuck in. As this is technically breakfast, I ask Ivan what he usually eats at this time of day. Oatmeal or pandesal bread with coffee comes the reply, but on weekends many Filipinos cook up rice and dried fish. 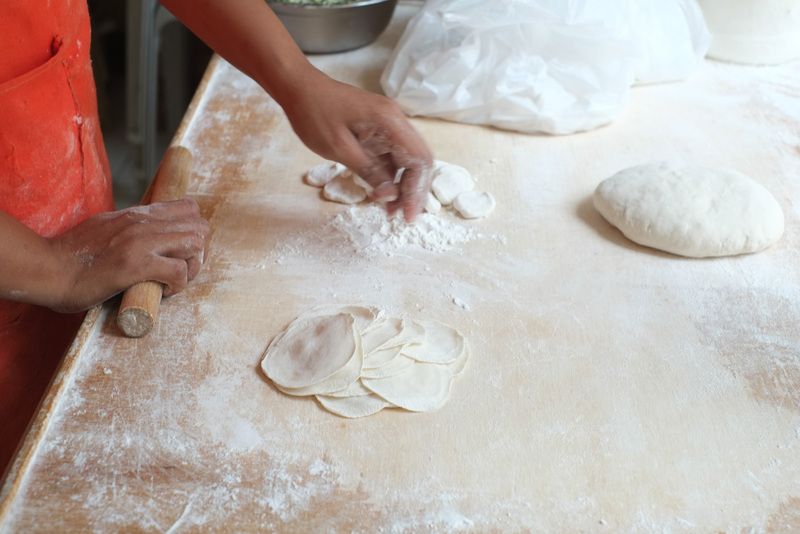 Next comes an education insiomai, Cantonese-style dumplings. Arriving at Dong Bei Dumplings, we are ushered upstairs, past a wooden bench piled high with bunches of spring onions and a table where two girls are expertly spooning a mix of mung bean noodles, mushrooms and celery on to a circle of pastry before pinching each one together in a shell shape. 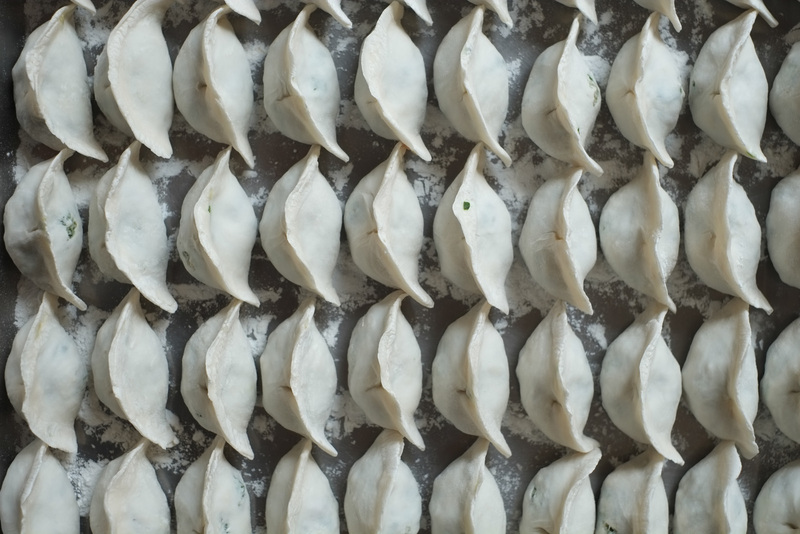 The most common filling for Cantonese-style boiled dumplings is ground pork, but our variation,jiaozi, also includes chives. We eat them with a splash of sauce that combines soy, vinegar and garlic. A couple of doors down, it is time for my favourite part of the meal — dessert. In this instance, it involves mango sago (like a refreshing mango soup with tiny, floating tapioca balls added for texture) and lemon-colouredsiopao (steamed buns) filled with egg custard, eaten in a booth at the smartest of our stops, the President’s Tea House. 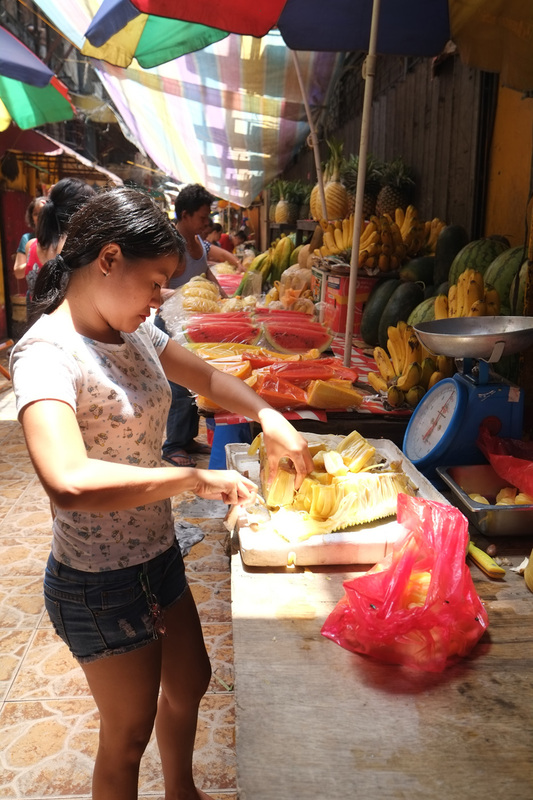 Mango tops the list of fruits that are grown here (green, unripe mangoes are eaten with shrimp paste or sugar and chilli), but pineapples, coconuts and cashews are also abundant. Keeping the sweet theme going a while longer, we pop into the long-established and renowned Bee Tin Grocery, where floor-to-ceiling plastic boxes are filled with preserved lemons, ginger, blueberries, salted plums, pork “candy floss” (which looks like sawdust and is added to porridge) and, of course, pickled mango. I realise that, as we’ve been walking, we have looped back almost to the spot where we started — Binondo church — but have only covered a single block. 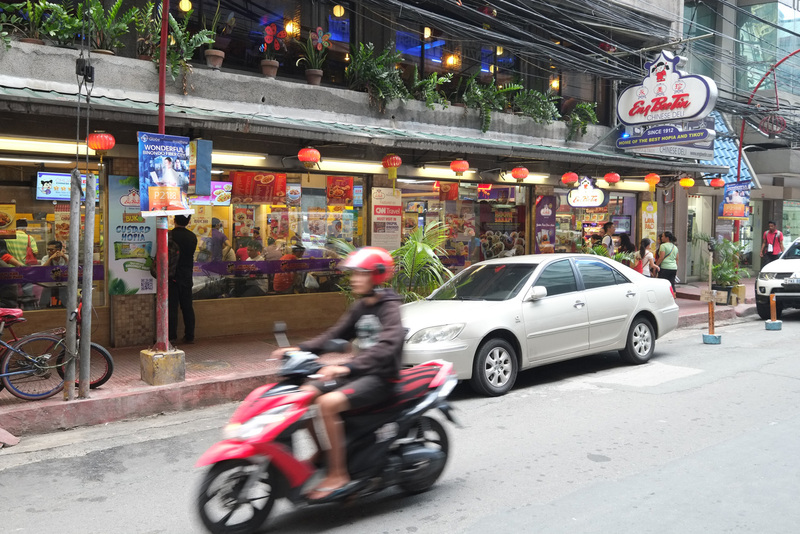 Indeed, we have only scratched the surface of the delicious food on offer in Manila’s Chinatown. Explore the medieval walled old town of Intramuros, the centrepiece of Spanish Manila. Highlights include the Unesco World Heritage site San Agustin church (don’t miss the native pineapple under the baroque pulpit), Fort Santiago and Casa Manila, a reproduction of a Spanish colonial house that offers a snapshot of life in the 19th century. Hop on a jeepney. It is the cheapest, most efficient way to get around. Each one has its route written on the side and costs seven pesos for the first 4km. There are no official stops: just stand at the side of the road and flag one down. VISIT foodies’ favourite, the Salcedo Saturday market, in the Jaime Velasquez park. You’ll find everything from hazelnut buns to beef salpicao (traditional Portuguese sausage). There are tables and chairs set up for lunch, or you can just grab a spot on the nearby grass. Open 7am-2pm daily. See the Richard Kissling-designed Rizal monument in Rizal park. The statue enshrines the remains of national hero José Rizal, who was executed by the Spanish authorities, fanning the flames of the Philippine revolution. Today, Rizal is a symbol of Filipino nationhood; his face can be seen on the one-peso coin.